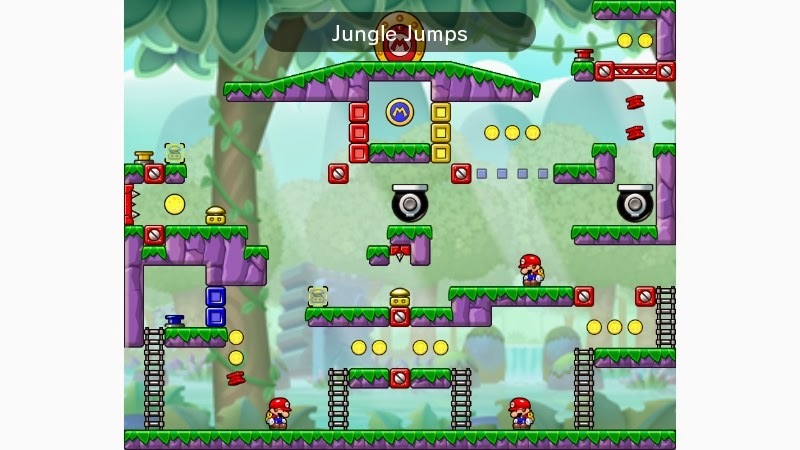 SuperPhillip Central: Try Out SuperPhillip Central's Custom User Levels in Mario vs. Donkey Kong: Tipping Stars! Mario vs. Donkey Kong: Tipping Stars has been out in North America since early this month, and it releases very soon for my European and Oceania pals. I rendered my verdict on the game, and during my time with Tipping Stars I accrued multiple custom created levels to tickle one's brain and reflexes. This is a sampling of the user levels I have made, and I'm quite proud of them. For all of these levels, search for Phil32 as the creator. Each level name links to its own Miiverse page. My first level is a total test of reflexes. 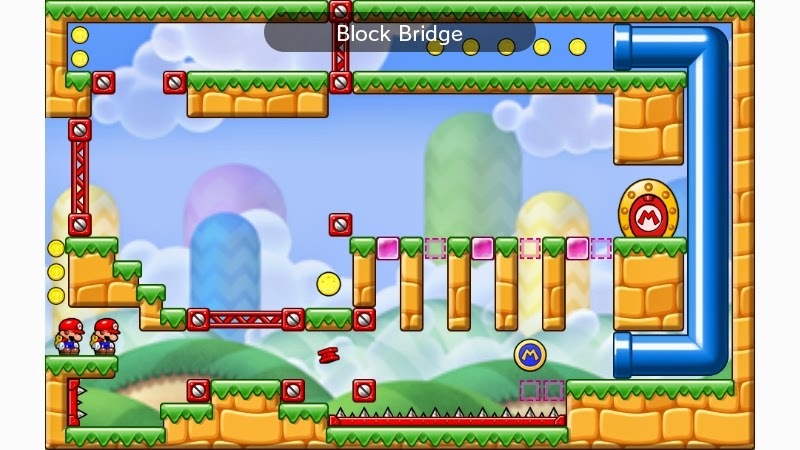 Guide two Mini Marios from the start of the level across a dangerous and unfinished bridge of pink blocks. You have three blocks to work with and six spots where the Minis can fall, so keep the pace to help them survive. 'Else they'll receive quite the spike-filled fate! This jungle is full of hijinks. 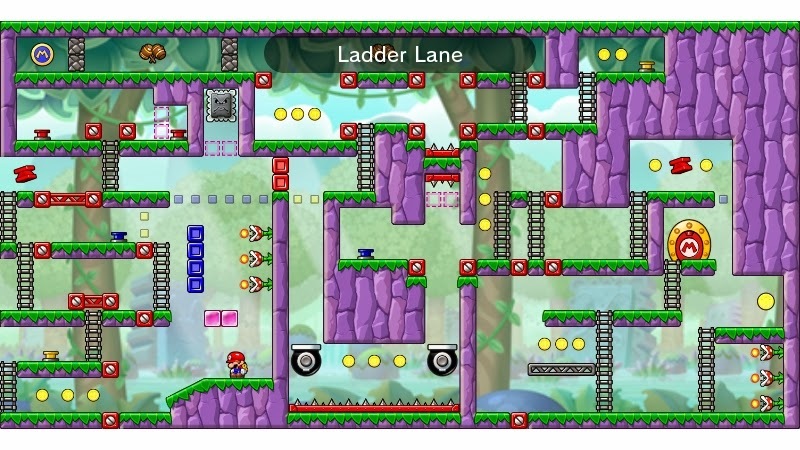 Press colored buttons to make their blocks disappear, creating paths for the Mini Marios to reach the goal with all of the coins collected. The main gimmick of this level is the amount of bounce pads that can send the Minis to new heights... and unexpected dangers! Are you good with girders? 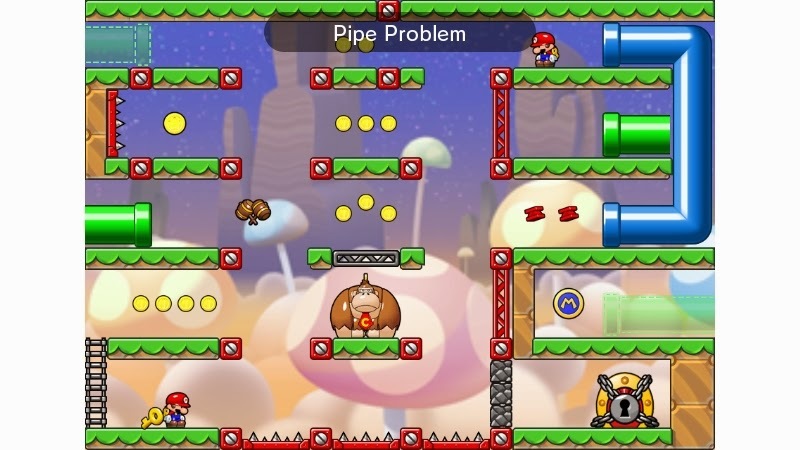 You better be if you want to challenge Pipe Problem, a level where creating girders and pipes in the proper positions will be the difference between victory and a shameful defeat. Remember that a Mini Mario that enters a pipe will also exit a pipe in the same direction. Get all of the coins, nab that hammer, and take out that Donkey Kong wannabe to reach the locked door! My only level that is one screen only with zero scrolling, Gravel Plain's name has less to do with the blocks buried inside the rightmost platform and more to do with the nasty Thwomp that will crush whomever is foolish enough to linger underneath it. 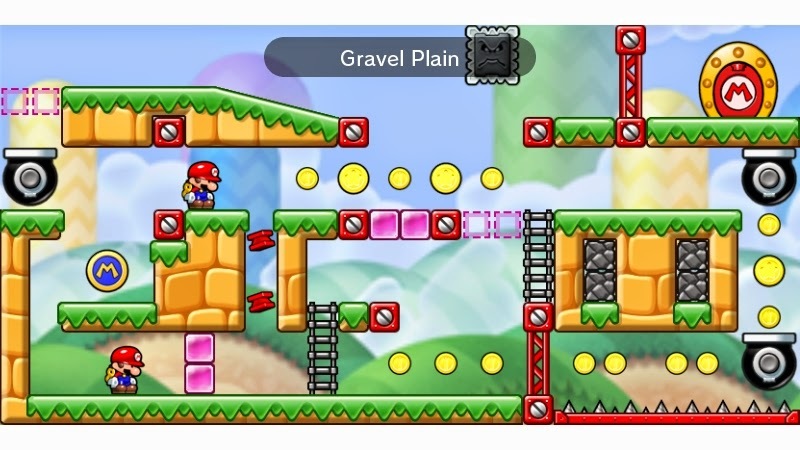 It takes careful placement of both girders and pink blocks to keep the Thwomp from smashing the Mini Marios. Use the cannons to accumulate coins as well as to reach the exit. 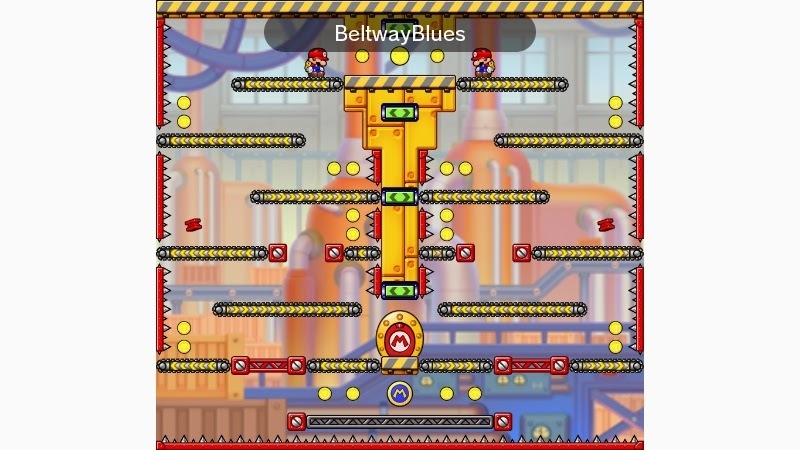 This level is mostly all about pressing the buttons to change the directions of the conveyor belts at the correct times. Otherwise the Mini Marios will become impaled on the spikes that line the sides of the level. 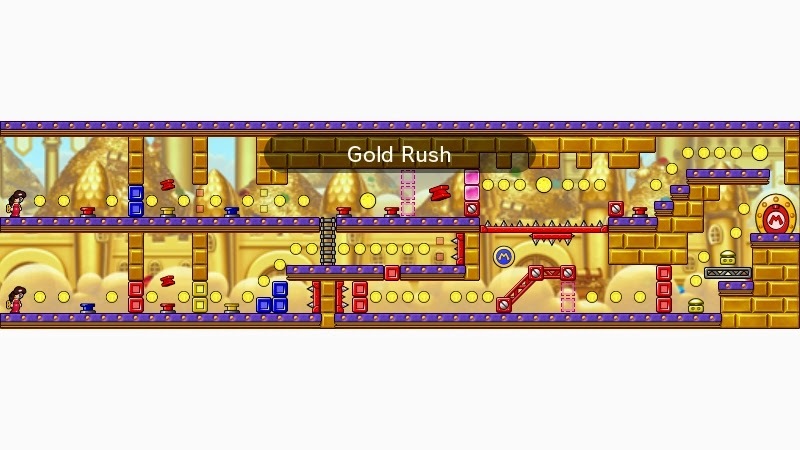 Simply beating the level doesn't pose too much of a challenge, but attempting to nab all of the coins requires some daredevil precision and timing! 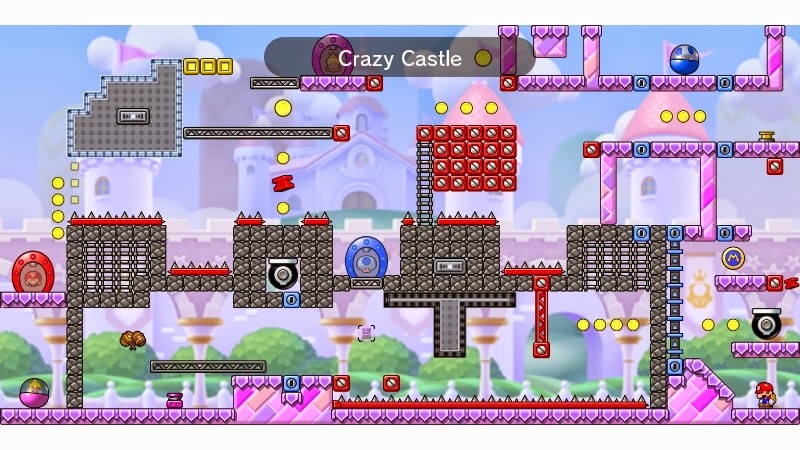 This level is a pure endurance run of multiple parts. Thankfully there's but one Mini Mario to work with here, but even with that bit of knowledge, the level is still rather tricky. There's dodging the fireballs of the starting column of Piranha Plants, hitting the colored switches in the proper order, situating girders correctly, cannon chaos, and an ending that requires one long girder to protect Mini Mario from a fiery fate. It's a level that is split up between sections to feel like an amazing journey that feels fantastic to conquer. There is no sign of Bugs Bunny at this crazy castle! Instead there are traps, tricks, and troves of treasure in the form of coins. Blast through the castle walls, saving each Mini along the way, starting with Mini Toad and then Mini Peach. As a hint, the last Mini that needs saving is the one you start with, Mini Mario. Can you collect yourself to conquer this castle? Don't you know? Coins are a girl's best friend. As its name would suggest, Gold Rush has players rushing to get both Mini Paulines to the same exit. This is all the while stepping on buttons to assist one another through their separate paths, only meeting twice in the level. Along the way, both figures can collect a cavalcade of coins to get a nice rewarding haul in. Of course, destruction may be the price to pay for greediness, if these two dames don't watch out. If you have your own level creations you'd like to share, feel free to post Miiverse links to them in the comments below!